Service orders often require specific product know-how not every staff member has at their disposal. So, dispatchers who are in charge of organizing their service team’s deployment have to know which specific skills are needed for the service orders and which staff members have these specific skills. This is the reason why Microsoft Dynamics NAV uses information about skills for resource allocation. The Visual Service Scheduler is a Gantt chart add-in being used as interactive, visual dispatch board in NAV and accessing the standard NAV data. Symbols let the dispatcher see which service employee has the required skills for a service item line. This way of visualizing helps to find the appropriate employee for specific customer orders faster and safer. Read more in this blog. While planning in NAV without visualization, the dispatcher allocates resources to service orders via a tabular-type dispatch board. The overview of the resource availabilities quickly shows which employees are available for the service item. In addition, employees with skills matching this task are indicated by the checkbox. However, gaining this information requires several intermediate steps. 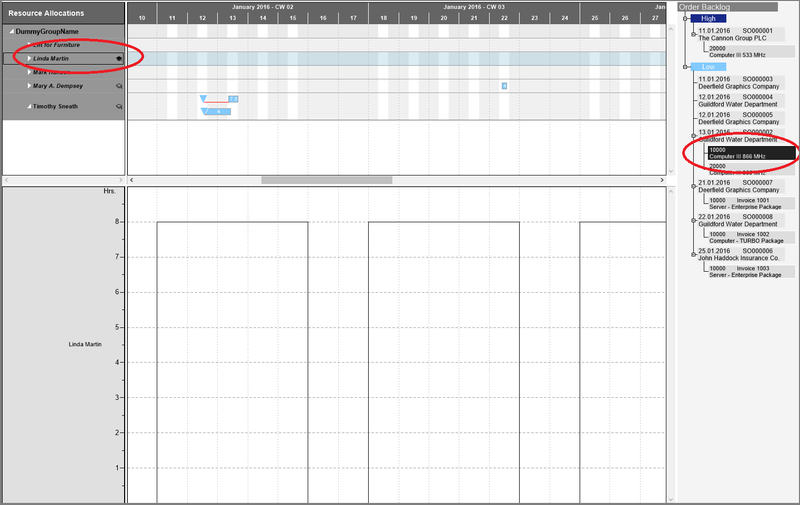 The screenshot below shows how the planner has to click his way through several tables and cards. In this example, the resource Linda meets the requirements in terms of skills for this service item. The Visual Service Scheduler (VSS) is an interactive planning board: a time-related visualization of orders and Service Item Lines of the Service Module. This overview shows the dispatcher, which employee works off a service Item Line and the employee’s availabilty. 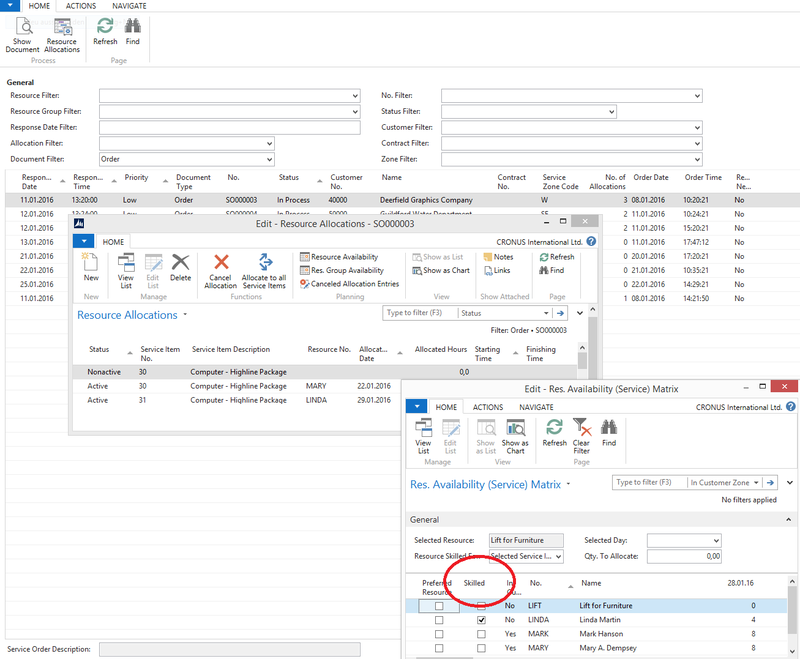 Service Item Lines that are not allocated can be drawn onto the selected resource simply by drag & drop. Information about the skills immediately appear after clicking a service item line: A black hat next to the service member indicates that she meets the requirements of this Service Item Line. Now the planner only has to determine the time and drop the bar at the according place. Saving in the VSS writes the modified data back to NAV. Working off a service tasks sometimes requires more than one skill. The more skills are required, the more difficult it gets to find suitable staff members. The VSS offers additional support for the planner by also indicating employees having not all but part of the skills, symbolised by a hat not filled. In some cases, a subset of the skills will do to process a Service Item Line in a satisfactory manner so that in times of high workload highly qualified resources can be relieved. If no symbol is shown, no resource offers the required skills. If the hat symbol is shown for every resource, there’s no skill specified for this service item so far. 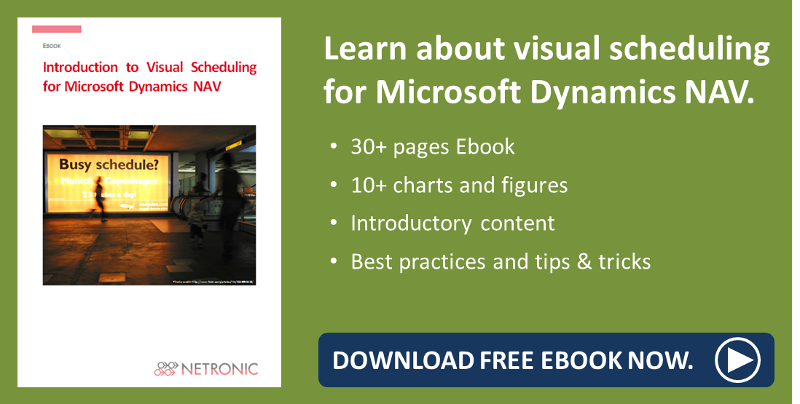 If you want to know how to send the service orders scheduled in the Visual Service Scheduler to your field workers read our blog post about End-to-End Service Scheduling with Microsoft Dynamics NAV.